Attention: When Folding Bicycle, please press saddle down until it steady. then make seat post out of seat tube as a stand when folding completely to protect crank safe. 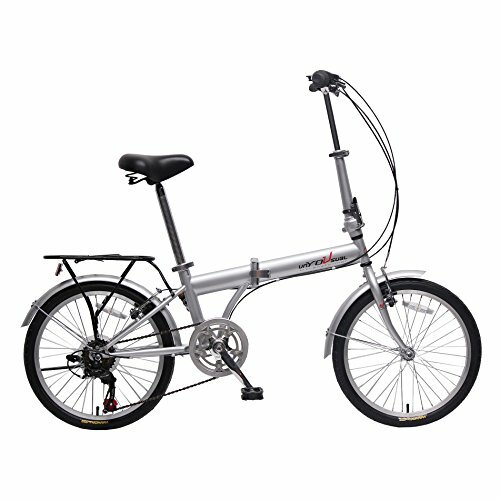 The brand new Carrier Silver folding bicycle comes with a dimension of 20 inches, great for ensuring both exercises as well as commuting. The derailleur gear parts and the rear V-brake are uniquely designed for durability, while the Shimano 6 speed shifter and the semi-alloy front are framed with metallic structures. Featuring strong 20" x 1.75 tires from the WANDA trademark. The Silver color cap alloy along with PVC black bell resists temperature effects and are easily removable. Very Stress-free to ride and assemble each of the parts. If you have any questions about this product by IDS, contact us by completing and submitting the form below. If you are looking for a specif part number, please include it with your message.